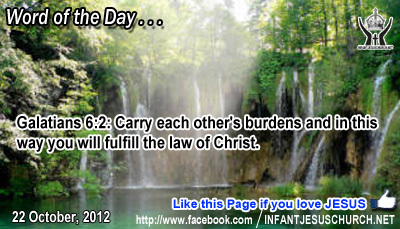 Galatians 6:2: Carry each other's burdens and in this way you will fulfill the law of Christ. Heavenly Father, help us to see the burdens in the lives of others around us and then react to those burdens with help. We want to be a blessing to the broken and dispirited, so please help us to find our place and our way of serving to your glory. In Infant Jesus' name we pray. Amen. Jesus reinforces his point with a parable about a foolish rich man. Why does Jesus call this wealthy property-owner a fool? Jesus does not mistake the rich man for his industriousness and skill in obtaining wealth, but rather for his selfishness and selfishness it's mine, all mine, and nobody else's. This parable is similar to the parable of the rich man who rejected to give any help to the beggar Lazarus. The rich fool had lost the ability to be concerned for others. His life was inspired with his possessions and his only attentions were in himself. His death was the last loss of his soul. In the parable of the rich fool Jesus gives an example on using material possessions. It is in giving that we receive. Those who are rich headed for God receive plenty reward – not only in this life - but in infinity as well. Loving Infant Jesus, free my heart from all possessiveness and from longing for what belongs to another. May we desire you alone as the one true wealth worth possessing above all else. Help us to make good use of the material blessings you give us that we may use them liberally for your glory and for the good of others.